Opening Reception, Friday, November 18 from 5 to 7pm. Artists’ talk, Saturday, November 19 at 2pm. 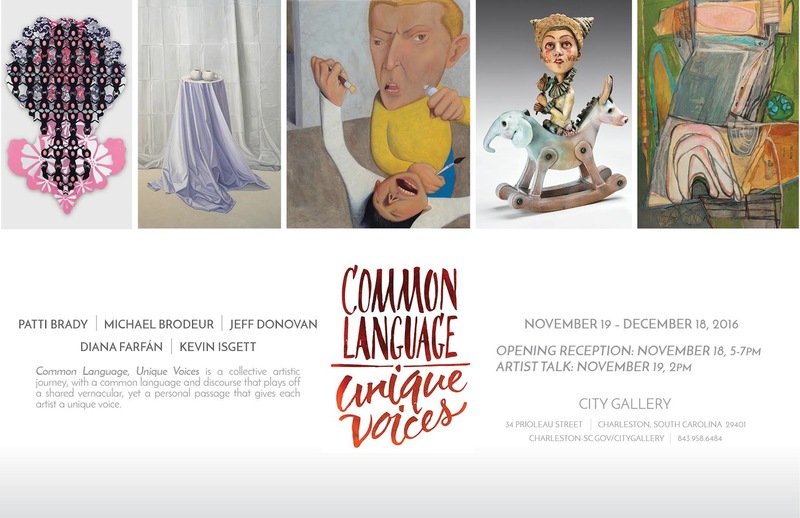 Common Language, Unique Voices includes the work of Patti Brady, Michael Brodeur, Jeff Donovan, Diana Farfán and Kevin Isgett, is an interpretation of the topical, social, political and cultural environment of South Carolina, where the artists live and work. It’s a collective artistic journey, with a common language and discourse that plays off a shared vernacular, yet a personal passage that gives each artist a unique voice. Elements of color, texture, rhythmic relationships, balance, and interpretations of spatial interactions are organized and weighted so that the viewer can experience the common themes of the artists, perhaps even hearing murmured conversations between the works of each artist and the works of the others.